New Listing at 112 & 115 Deerhaven Road. Price Reduction at 115 Windermere Road. 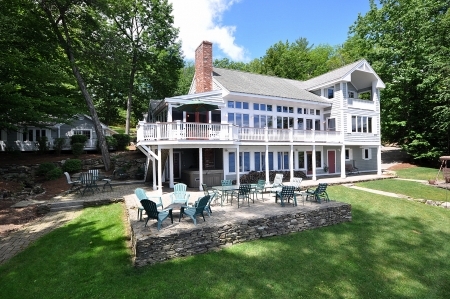 112 Deerhaven main house on 200 ft. Winnipesaukee waterfront. 1 of 3 homes in this Winnipesaukee family compound. Moultonborough NH - This sprawling 5.38 acre family compound has 3 separate homes, each with its own kitchen, large screen porch, living area, bedrooms and lovely lake view. 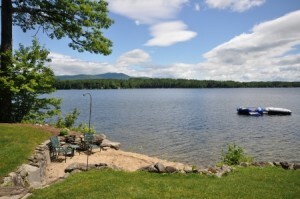 112 and 115 Deerhaven is comprised of 2 lots of record totaling 5.38 acres with 200 feet on Winnipesaukee. 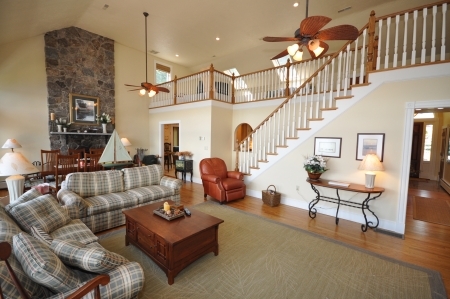 Main Home Features great Room with Floor-to Ceiling Fireplace, Vaulted Ceiling and Expansive Windows. The 3 separate homes total 6026 square feet of finished living space, including a main home with 5 bedrooms. Interior features of the main home include a 4 season sun room, enclosed porch, extensive decking, and a vaulted Living Room w/ lots ofwindows and a floor-to-ceiling fireplace. (View the new virtual tour of 112 and 115 Deerhaven.) One of the most desirable ways to enjoy the pleasure of friends and extended family if to have them nearby, but yet to have privacy for all as well. 112 and 115 Deerhaven offers spectacular lake and mountain views, large lakeside patios, a deck that could not be duplicated today, and a large sandy beach. 112 and 115 Deerhaven are located in a quiet bay, near the end of a quiet road. Biking and walking trails are nearby on Moultonborough Neck Road. View the listing sheet for 112 and 115 Deerhaven, Moultonborough, NH. Or call now for details, color brochure, or to make an appointment to tour this one-of-a-kind family compound. (603) 707-7575. Beach at 112 & 115 Deerhaven on Winnipesaukee. A Family Compound in a big bay perfect for water-skiing, swimming, or canoeing. With few new construction homes under $2,000,000 and few estate parcels left on the lake, 115 Windermere and similar properties are getting increased interest from Buyers. Sellers are still reluctant to bring their prices down, knowing that no one is making more land around Lake Winnipesaukee. The current inventory of new and newer homes available under $2,000,000 has been rapidly bought and removed from the available inventory in the first half of 2012. 115 Windermere is an estate parcel with an older year round home offering 1.6 acres, 235 feet of Winnipesaukee waterfront, and a sandy beach. Located near the middle of Lake Winnipesaukee 115 Windermere is a great spot to access the towns around Winnipesaukee by boat. Boating in the vicinity offers some of the most beautiful vistas on Winnipesaukee. 115 Windermere is an updated older home with knotty pine interior, fireplace, porch and deck sited very near water's edge. For people looking for a cottage style year round home to use until they build their dream home, 115 Windermere is a perfect opportunity. MLS # 419350 has just had a $200,000 price reduction and is now offered at $1,195,000. Call now to tour this Moultonborough Winnipesaukee home. (603) 707.7575.